Details of the Royal St. Christopher and Nevis Police Force’s six-point plan to enhance public safety was shared with residents on Wednesday (July 15) by the Prime Minister and Minister of National Security Dr. the Honourable Timothy Harris. The multi-pronged approach stresses i) Crime Prevention ii) Intelligence-led Policing iii) Targeted Operations iv) Collaboration with other Agencies v) Engagement of Stakeholders and vi) Improvement in Administration. Crime Prevention calls for greater use of the Mobile Command Unit in various communities, high visibility policing, reinstating the Police Boys Club and strengthening the Teens and Police Service (TAPS) Academy and the Mentoring, Advising, Guiding and Instructing Children (MAGIC) programmes. Intelligence-led Policing involves developing new databases, expanding CCTV coverage and other forms of surveillance. Joint operations with sister law enforcement agencies, traffic enforcement exercises and increased use of K9 officers are outlined under the Targeted Operations heading. Collaboration with Other Agencies will see closer partnerships with the judiciary to reduce prosecution delays. The Ministries of Health, Education and Social Services as well as the Department of Public Works will be engaged to ensure matters related to their field that impact public safety such as truancy are addressed.Â Engagement of Stakeholders focuses mainly on communities around St. Kitts and Nevis, forging relations with non-governmental agencies, encouraging neighborhood watches and having regular media appearances to update the public. Under Administration, performance appraisals for all ranks will be reviewed, best practices from other organizations adopted and revision of applicable laws, regulations and Standing Orders within the force. That commitment was recently demonstrated when a request was made by law enforcement to acquire a microscope to be used for forensic investigations. The price tag was close to half a million dollars and its purchase was not covered in the budget. The cabinet acted promptly to approve the necessary funds. “Not a day is to be wasted in terms of the fight and the commitment of this government to this matter of crime because we recognize that we are at a critical stage and the sooner we act the better,”Â emphasized the Prime Minister. 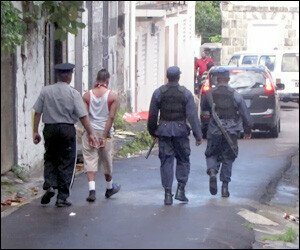 The six-point plan will buttress the increased actions of the police which in the past weeks have seen a number of stop and searches, abandon lots and derelict vehicle searches, and other security-related operations. The activities recorded a number of successes that has resulted in several arrests.